The Thewasathan Phra Mae Thoranee Shrine is located in Khon Kaen city centre next to the Chao Por Lak Muang (City Pillar Shrine). The Thewasathan Phra Mae Thoranee Shrine is open 24 hours a day and admission is free. Phra Mae Thoranee is the Earth deity from Buddhist mythology. During the long meditation session at the end of which the Lord Buddha achieved enlightenment he is said to have faced many challenges. One of those challenges came from the Demon Mara who tried to attack the Lord Buddha with his army. The Lord Buddha’s response was to touch the ground and call forth the Earth deity (Phra Mae Thoranee) who appeared in the form of woman. 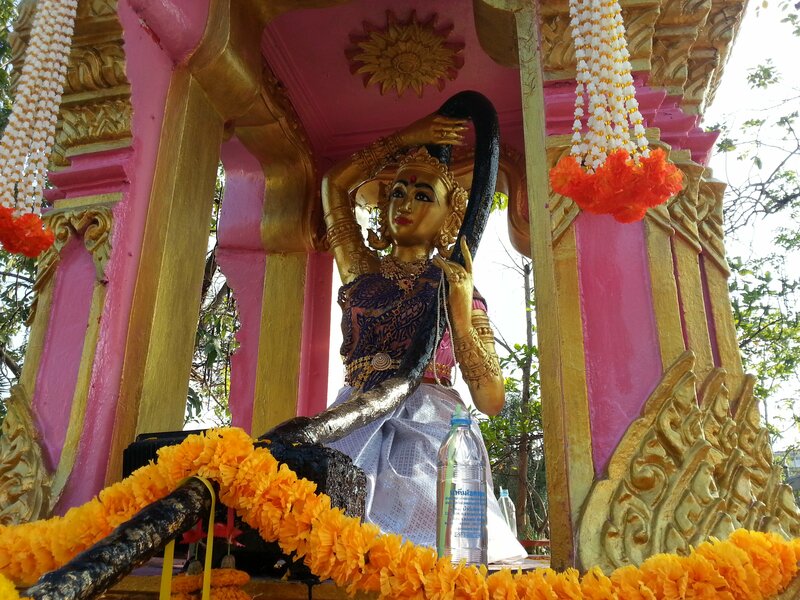 Phra Mae Thoranee squeezed the water from her hair causing a flood which drowned the Demon Mara and his army leaving the Lord Buddha to continue on his path to enlightenment. Many Thai Buddhists come to this shrine to make prayers and offerings to Phra Mae Thoranee to ask for her assistance. Phra Mae Thoranee is seen to embody the virtue of compassion. The shrine is also where the Water Ceremony takes place. During the Thai Buddhist Water Ceremony monks pour water from a glass into a vase and then onto the ground to return the water to the Earth deity. The belief is that the pouring of the water is a way of connecting the 31 planes of existence in Buddhist theology. Around the Thewasathan Phra Mae Thoranee Shrine there are lots of other statues and shrines relating to Hinduism, Taoism and Chinese folk religion. 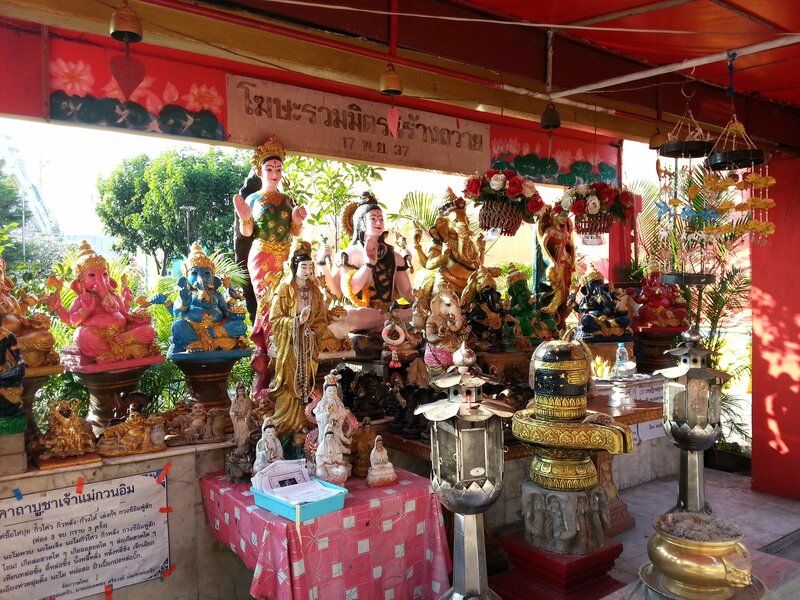 Thai people come here to pray for things to happen and not happen and appeal to a range of deities for that reason. 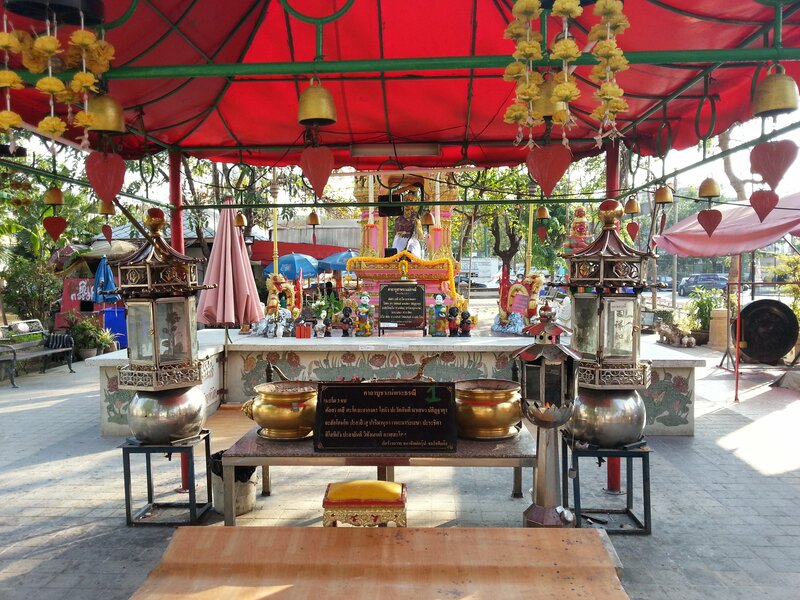 Religious and superstitious beliefs are very complicated in South East Asia and they draw on multiple religious traditions, including local beliefs that predates the introduction of Buddhism to Thailand. If you can visit the Thewasathan Phra Mae Thoranee Shrine with a Thai person who can explain what everything means then you definitely find a visit more interesting. The Thewasathan Phra Mae Thoranee Shrine is located 8.9 km from Khon Kaen Bus Terminal 3.